Our responsibility as practitioners of Baraw Sugbo is to preserve the art. Teach it to next generation of martial artists, and to apply the same methodology of teaching that has served the art well for the past century. One important methodology of the system is that Baraw Sugbo is initially taught as a defensive martial art, you are taught how to defend yourself against a knife attacker. This is naturally the normal approach of teaching blade based Filipino martial art in the Philippines. The defensive approach is also the more challenging and difficult part of any system. The more recent approach now, is to teach a student how to use a blade to disembowel a human being. Although a very effective means in dispatching a person, the defensive aspect should be always taught first. The defensive approach of teaching Baraw Sugbo to a new practitioner speaks of the long history and clear lineage of Baraw Sugbo. Posted in behalf of Romy. 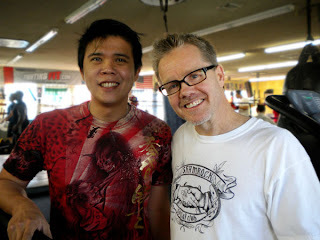 I spoke at length with Freddie Roach at Wild Card Boxing Gym on Wednesday, and he was very upbeat and excited about traveling to the Philippines this Saturday, and training in Baguio City for four weeks. I asked Coach Freddie what he thinks about the Mayor of Baguio City, Reinaldo Bautista Jr., asking residents of Baguio City to cooperate with the security measures and to give Manny room to do his road runs and work out. Roach conceded that training in the Philippines, offers a lot of distractions for Manny. With a lot of high profile personages dropping by to see the mythical pound for pound king train for the coming fight, and it would not be easy to say no to these politicians and celebrities. I brought up the subject of the latest Floyd Mayweather Sr. brouhaha, alleging steroid use by the Pinoy Idol, Manny Pacquiao. I mentioned that Miguel Cotto is known for applying pressure and power punches against his opponents, how do you think that’s going to work against Manny?